Manchester United manager Ole Gunnar Solskjaer, speaking to BBC Sport: "We started too slowly and played into their hands. Our possession wasn't bright enough and quick enough, so it's disappointing. "I didn't think we had enough quality in the last third, enough combination play. We had decent dominance with the ball in the first half but that doesn't help if you give the ball away and they can counter. "This was a big step backwards, mainly because of the quality of the possession and the passing." Manchester United manager Ole Gunnar Solskjaer: "Some of the players go away with the national teams and they'll enjoy the break. We've got to go again. We've had a great run and now we've had two defeats., Against Arsenal we just couldn't score and today was poor - the poorest we've played. "I'm here until the summer, we've got loads to play for in the league and the Champions League." Wolves thoroughly deserved it, they were much the better team, their game plan worked to perfection. They knew they would get chances in the second half and they took them. Manchester United looked absolutely shattered. 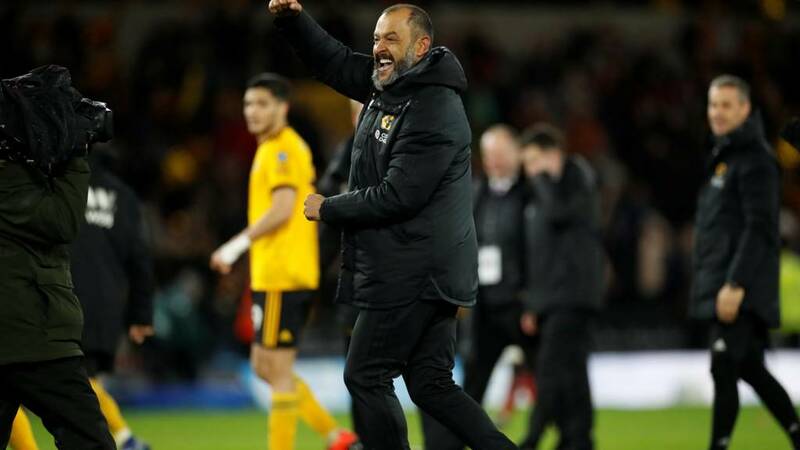 Wolves manager Nuno Espirito Santo, speaking to BBC Sport: "I'm very proud of the players. We had composure, shape, good running. Very well done to the boys and it was a fantastic atmosphere. "It means a lot because we know how big Wolves were in the 1950s and 1960s and there are people in the stadium who have memories of that. To try to achieve the same is much, much harder now but we will try step by step. We will respect everybody in the semi-finals." Wolves captain Conor Coady speaking to BBC Sport: "We have some phenomenal players going forward. This takes us forward, two years ago we were in a bad place and these people are going to follow us and I can’t tell you how proud I am of everyone. "It is a deserved result we were outstanding. From start to finish we nullified them - they are an unbelievable club with talented players. We said before in the changing rooms we have the chance to make history and we now have the chance to go through again. "It is where we all want to be. in two years the club has gone a long way, we are all pulling in one direction, it is an amazing night for everyone." "We make history, we want more and I am happy for all these people every game." Wolves have shown the respect the competition deserves by playing strong teams. They haven't got a big squad but they have always gone out and played a strong side and they deserve to get to the semi-final because they have been magnificent all season. For now, though, our FA Cup day is done. Turn your eyes to Match of the Day now for your late-night football fix, and I'm going to leave you with a reminder of some of the best reaction from Molineux. Goodbye. Remember, there is one more place in the FA Cup semi-finals up for grabs. Millwall host Brighton in the fourth quarter-final tomorrow at 14:00 in a game you can see live on the BBC. More from Nuno Espirito Santo, on playing with a small squad: "When the transfer window happened we decided to go this way with 16 players. Every member of the squad is important and is always involved in competition. Of course there are risks but it is my belief that a small squad can achieve things." So frustrating - we just didn't turn up. Fair play to Wolves though, totally deserved with a clinical, dogged performance. Hope they go on to the final. As for United, still fully behind Ole for the job. And I feel the international break has come at the right time for us. We looked knackered tonight and we have a massive April coming up!